Our hands-on art classes are taught by artist-teachers, and frequently inspired by art on view in the Gallery. We teach, inspire, challenge, prompt and encourage. We love it when you make the artwork you never thought you could make. Ask us about our Family Discount rate! Call 585.276.8959. Grow your art skills this spring at the Creative Workshop! Watercolorists and ceramists are inspired by flowers and the shapes of nature, and children in our classes love to go outside to draw in Centennial Sculpture Park. MAG members may sign up NOW—ahead of the crowd—for any class in the spring brochure. Not a member? Registration opens March 5 for all classes, camps and spring and summer . Already enrolled in a Spring Class? SPRING ART DAY SCHOOL UPDATE: All Monday and Tuesday sessions are full, but some spots remain for the rest of the week. Spots also still remain for Teen Fashion Camp, a week-long camp where teens learn to design and sew their own creations. Call us at 276.8959 to learn more. 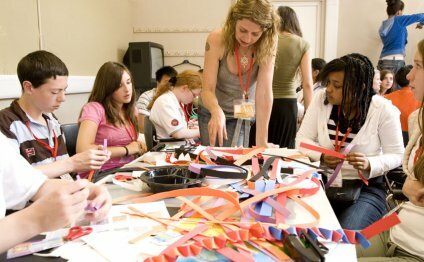 Have materials or fashion magazines you can donate for Teen Fashion Camp? Call 585.276.8959. Know someone who would love to take a class at the Creative Workshop, but you are unsure what level would best suit them? Or someone who just needs that extra little nudge to ‘get back into art?’ A budding artist? We have classes for all ages and levels. Now you can give them the gift of art. Pick up a Gift Card and help pay for a class. Cards are available in a variety of price ranges, from $10 to $400. Our hands-on art classes are taught by artist-teachers. They teach, inspire, challenge, prompt, encourage, and support as you make artwork you never thought you could make. Shown right: Eddie Davis III. View all current faculty bios. We are currently accepting applications from current college students in art, art education, or art history with significant interest in children’s interaction with museums to earn internship credit and valuable experience. See the factsheet here. iPad Art Workshops with Mandy McMahan.